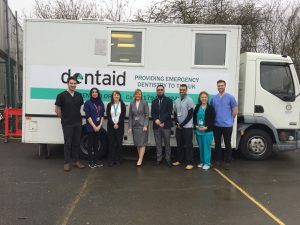 Recently Dr Lad and Becky one of our nurses have helped out on the Dentaid van. Dentaid is a UK charity where dental professionals volunteer to provide much needed dental care to the most vulnerable people both in the UK and abroad. In recent weeks they have worked on the mobile dental unit providing care for children in Dewsbury. Also Becky has been with the van in Leeds, providing emergency care for the users of the charity Joanna Project. Their time on the van has been a very rewarding experience.